When I took part in the first SunSilk blogging contest and submitted my blogpost, I was rolling around on the floor laughing. I thought my post was funny. I showed it to my daughter and then to my son who wore grim expressions even after I showed them the funny parts, I should have known then, but like I say, I am conceited and do think that I write well. I was sure that I would win the top prize. Obviously, the people who matter did not think so, and I had to settle for the consolation hamper prize to the first 100 bloggers who responded. 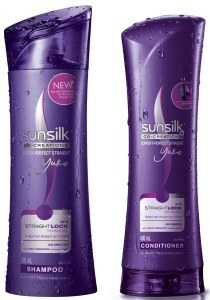 Then the second contest for SunSilk Perfect Straight was announced and I was happy that I would have two samples for free and all I had to do was submit another blog post. The gift hamper and the samples did not arrive and then I received an email asking me if I had received the sample, I said no and left it at that. The same day I got a call and this guy asked me my name and address. I was alert, immediately. Was this the same bank loan recovery agent who has been harrassing me for the last two years? Since this guy was vague and I was suspicious, I did not give him my name or address and I told him to deliver the parcel at the address given and cut him off. He called up twice after that but I did not reveal my address. A week later this auto driver located my address to hand over the twin gifts. Apparently, he is an auto driver and a part time courier delivery boy too. I was wondering why was such a shoddy courier service chosen by SunSilk to deliver the parcels? Already there have been two postponements and what if the parcels are delayed or not delivered at all? Well, that is for the contest organizers to ponder over. After all, they are going to get over a hundred reviews and the feedback could be invaluable. I am sure some of those reviews will be used as testimonials. I was thrilled to have finally received my gift. I decided to try out the sample on myself and my wife was a reluctant volunteer. I am not a great fan of any shampoo, because it leaves my hair dry and later it gives a frizzled look and the hair looks weird and unweildy. Normally after a shampoo bath, I use a little oil so that my hair stays manageable and soft. We struggled to read the instructions in fine print (something the technical writers and packaging professionals can quickly rectify). After about a week's usage the results have been satisfactory, in fact, good! My hair which is not thick seems to have more volume and the hair is now falling on my forehead, more to cover it than to expose it. The hair stays set for the whole day and does not expose the thinned out areas of the scalp. I would not say that the hair is ramrod straight but it does tend to flop over in a thickish mop. Plus, it allows me take a parting from either side which was unthinkable prior to using this shampoo and condtioner. Earlier, once I had dried my hair and run my comb through it to give it a particular style, I could never make a change afterwards. The hair would stand up in protest and that day would surely be a 'bad hair' day. The smell is mild and classy and does stay on for long. A small amount of shampoo is enough to generate rich lather and is easy to rinse off. I was apprehensive about the conditioner because in the instructions it said 'not to apply on the scalp'. I wondered why ? I am careful in squeezing out a small amount and apply it on the hair, avoiding the scalp. Can someone enlighten me on how exactly to use the conditioner? My wife is happy with the results as her naturally straight hair has become soft and full. She is happy with the pleasant, lingering fragrance. She is happy to find out that her hair is pliant and manageable, hours after the shampoo bath. The rich, nourished look is noticeable and draws admiring looks. She is seriously considering a change in shampoo and conditioner but is also wondering if the cost would be within her budget, now that the grown up young adults in the family are clamouring for Sunsilk Perfect Straight.